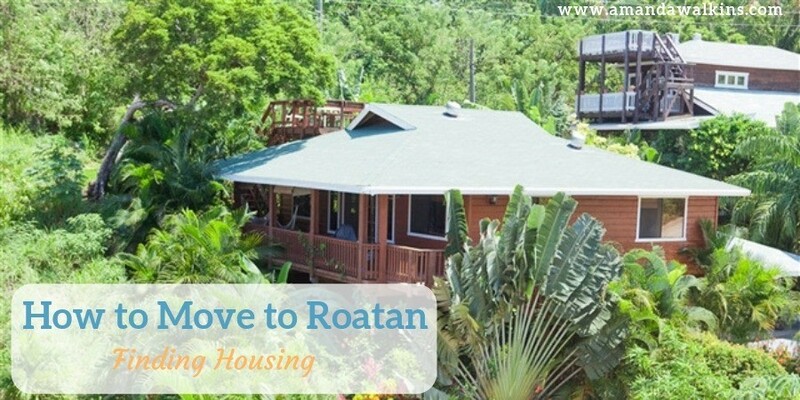 In an effort to answer a few of the most commonly asked questions I get via email, Facebook, and here in the comments, I figured I’ll give some more general info on moving to Roatan. You’re all curious, so here’s the first part in a new series to try to answer your questions. Part One: Housing! Housing is understandably a concern when you’re thinking of moving somewhere new, especially a new country. Finding a suitable place, knowing the right neighborhoods, getting a good deal – these are everyone’s concerns. So here’s the best I can offer for now…Roatan rentals and real estate 101. Finding an apartment rental in Roatan is incredibly easy. First recommendation: don’t bother booking anything from home. Come here first and get familiar with the island. If you’re planning to stay here long-term (more than 3 months), you’ll get better deals here than you will searching online. Lots of listings never make it online beyond the close expat circles already on-island. Once you’re here you can ask around, get to know people, and better select a long-term location suited to your needs. Online, this island looks tiny. You could live in French Harbour and work in West End – I mean, come on, it’s only about 15 miles away! And then you get here, your world shrinks, and you realize that those 15 miles are driven on a winding single-lane road with nutso drivers who obey zero traffic laws from any country. Trust me, you don’t want to do that commute. If you want to commute, why move to an island? Island Rose Rentals offers long-term and vacation homes throughout Roatan. This is Ocean Breeze Villa in West Bay. Looking online for an apartment won’t tell you that there are 20 stray dogs that run around that particular neighborhood barking at all hours and freaking out your kids/pets/you with potential attacks. Looking online won’t show you that absolutely zero cabs or buses are willing to make that heinous drive on the dirt road riddled with potholes causing them to get stuck in rainy season. Trust me, unless you’re here on vacation or just a few months, wait until you get here to find a place. It’s really not hard at all. Roatan Life Vacation Rentals also offers long-term apartment/house rentals. This is Mango House in West End. I’ve broken down prices before so I won’t rehash that, but here’s a general idea of what you’ll get in an apartment rental in Roatan. Most are fully furnished since people come and go so frequently and nobody carries their couch and flatscreen on a plane. Furnishings typically include a TV, couch (of sorts), table and chairs, and beds. Again, seeing the state of furnishings in person will be better than finding a place online whose photos could very well be 10 years old. Most will have basic kitchen appliances: toaster, blender, coffee pot, microwave. You’ll likely have a gas stove and you’ll use 5-gallon water jugs for drinking water. Many houses run their water on an electric pump – meaning when the power goes out (which it does fairly often) you will have no running water. These are all things to consider when choosing a long-term home in Roatan. If not having running water is a major issue, look for a place with a generator. If not having stylish and updated furniture and appliances is a deal-breaker, expect to pay more for a newer place. The options really vary widely so being here in person to check them out yourself is truly the best option. Word of mouth is powerful on the island – let it be known you’re looking for a place and I guarantee somebody knows somebody with the perfect solution. I highly recommend renting before buying. HIGHLY. Living on an island is not for everybody – and living in a developing nation with less than perfect infrastructure and a completely different legal system can be too much for some to handle. If you’re a go-with-the-flow type of person, you’ll be fine. But be honest with yourself, understand the limitations island living can present and understand the frustrations some expats feel with construction, legal red tape, and infrastructure issues before purchasing property. If it’s the right choice for you, it’s paradise. If you buy a plot of land thinking you’ll have a gorgeous house built in a few months, you need a reality check. Things happen on island time, costs are always higher than originally quoted, and upkeep on a home on the beach can destroy even the most patient homeowner’s composure. All that being said, living in Roatan is amazing and if it’s the lifestyle you’re looking for you will be successful and happy moving here. Roatan has a booming real estate market right now. Whether you want beach-front or hillside, mansion or condo, rustic or modern, the options are plentiful. Contact Roatan Life Real Estate for the widest array and best service. Prices can range anywhere from $100,000-$1,000,000 between small homes and sprawling mansions, so they’re not just giving you lip-service – there really is something for everyone’s budget. This is an example of a typical Palmetto Plantation property for sale through Roatan Life Real Estate. That’s part one in a series for How to Move to Roatan. Next up: Working Abroad.